I love visiting Italy, sampling its food and wine, and learning about its history, culture, and architecture. Since I am the writer behind the Tuscany novel series, you might guess something else about me. I love writing about Italy. There is, however, one piece missing for me. I know a few words and phrases in Italian, but am embarrassed to admit that I am far from proficient in this beautiful, melodic language. I’ve enrolled in Italian classes, studied phrase books, and dabbled at listening to language tapes—to date without success. I may have found a solution for this problem. The Iceberg Project, the brainchild of Cher Hale, has the mission of helping people become conversational—not fluent—in Italian. The Iceberg Project focuses on the real connection between real people, which is something out of my own playbook. It also offers the credo: “Permission to chase your wanderlust granted.” This sounds more and more like something that I might work for me. I met Cher Hale—a delightful, engaging woman—and discovered the Iceberg Project, through our common love for Italy. 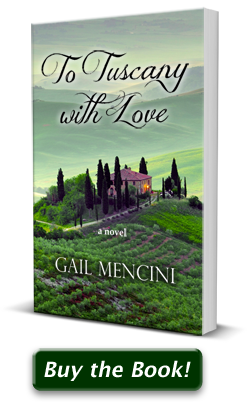 Cher had learned of my novel, To Tuscany with Love, and wanted to discover more about the book and its plot, as well as my thoughts on visiting Italy. She asked me to join her in a podcast. Cher interviewed me and I would like to share the podcast link with you. I had a wonderful time with Cher discussing To Tuscany with Love, the writing process, and how I came to be a novelist.